Stewardship and respect are key concepts in the burgeoning agricultural and culinary movement known as “snout-to-tail,” which promotes humane farming as well as the purchase and use of the whole animal, instead of a few popular cuts. While use of the whole animal is centuries old, the rise of industrial agriculture pushed the practice out of popularity. In Philadelphia, the snout-to-tail movement has made a resurgence largely due to the efforts of Judy Wicks, founder of the White Dog Cafe. Wicks calls her 2003 decision to begin purchasing whole pigs from a local organic farm for the White Dog, and to encourage other businesses to do the same, as “the turning point in my whole life.” Initially, Wicks hoped to capitalize on responsible use of humanely raised meat as an incentive for customers (a unique offering among Philadelphia restaurants at the time). What she realized is that humane and environmentally sound food practices shouldn’t be trade secrets, but “systematically available,” shared among many homes and businesses. Fair Food, which was founded in 2001, is one of the outgrowths of Wicks’ activism. In addition to their farmstand in the Reading Terminal, Fair Food acts as an aid to restaurants who want to buy directly from farms. In October, I joined Fair Food and a lucky group of city-dwellers (including special guest Wicks) on a Snout-to-Tail Tour. The day included a trip to Smucker’s as well as a visit to Sweet Stem Farm in Lititz, Pa. and a pork dinner at Green Meadow Farm in eastern Lancaster County. A married couple who have worked together full time since 2005, Sweet Stem Farm owners Philip and Dee Horst-Landis raise sheep, pigs and cows on 60 acres of land. Sweet Stem adjoins Meadow Run Farm, where Dee’s brother raises poultry—our arrival is welcomed with a high-pitched chuckling of turkeys, bickering, nibbling and huddling together on an open pasture. Sweet Stem Farm sells 1,500 pigs a year (raising up to 800 at a time) to markets like Whole Foods, the Fair Food Farmstand and local cooperative food markets. 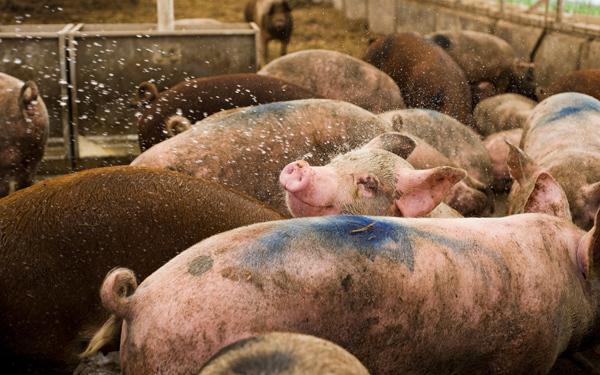 In about 100 days on the farm, piglets grow from 60 pounds to 260. Philip and Dee also raise grass-fed beef and sell 250 lambs annually from their 150 ewes. What Philip and Dee call “high-touch farming” gets expensive, including the use of hard-to-find organic, non-genetically modified corn and soy feed. They also ensure veterinary care to any animal in need, regardless of overall cost-effectiveness. But even the happy pigs have to meet their end. And it’s an important step for the meat consumer to learn about as well. 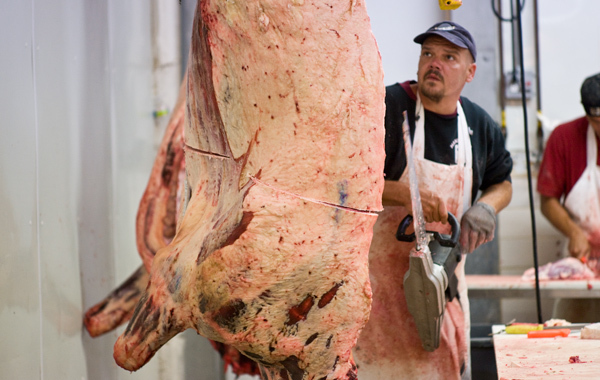 Slaughterhouse proprietors are the “unsung heroes of the food supply chain,” says Marilyn Anthony, Eastern Regional Director of the Pennsylvania Association for Sustainable Agriculture and a former professional chef who champions snout-to-tail purchasing and cooking. She recalls times in Philadelphia’s past when small-scale butcher shops were a common sight and an integral part of the community. Anthony also has plenty to say about the benefits of snout-to-tail purchasing for modern-day consumers. “Farmers struggle for a way to get value from that vast landscape of the animal’s body,” she says, noting that the most popular cuts often make up only about 30 percent of the animal. If consumers always choose New York Strip and tenderloins, instead of roasts and briskets—or pâtés, belly, cheeks, organ meats and trotters, popular in cuisine outside the U.S.—the waste piles up and farmers’ profits go down. Shoppers dismayed at the price of pastured bacon, pork chops and steak should realize that not all cuts of meat—even organic, humanely raised ones—are expensive. For easy, affordable dinners, Anthony urges consumers to break out the slow cooker. This cooking method, which has seen a resurgence in popularity, offers a way to use cuts that are less in vogue. As a chef, Anthony also calls ignoring lesser-used cuts “criminal” from a flavor standpoint. She particularly enjoys liver and sausage—an especially good snout-to-tail choice, as the trim that comprises sausage makes up a large percentage of the animal. “I couldn’t care less if I never ate another steak in my life,” she says. Farm tour participants discovered this for themselves at the concluding Snout-to-Tail Tour dinner. Even the headcheese, a gelatinous, briny, savory meat concoction that included pigs’ feet, was a favorite. Of course, some feel that only vegetarianism makes for a humane menu. But for many others—from farmers and butchers to chefs and consumers—the snout-to-tail approach restores sustainability, gratitude and pride to the practice of raising and eating meat. Find out more about Fair Food and their farm tour series at fairfoodphilly.org.